Sally, better known by bloggers as my custard pie is someone I follow on a regular basis. She lives in Dubai (where I have been) and spends her holidays in Devon, an area of England I love and would move to tomorrow if I had to. This month she is hosting Meeta’s Monthly Mingle. Her challenge – make custard – how apt is that! I have made all sorts of custards as you need them for ice cream and for crème brûlée as well as for our traditional bobotie. You even need to make a custard to fill profiteroles. I decided to really challenge myself and turned to my trusty Larousse for help. I chose to make a custard I had never tried before, and so a baked custard was the dish I decided to try. This is a cold custard that takes very little effort to make. It’s pretty hard to beat the combination of chocolate and custard and this looks so thick, creamy and delicious. Yum! This chocolate custard looks great! Could you try anything other than dark chocolate. Don’t like the bitter taste or does that go away when you cook it!! Mmm…when my daughter comes home I like to have small treats ready for her and comforting chocolate sounds heavenly. This custard sounds so easy and so good. I like a nice dessert that is a little lighter than cake, etc. I had a boy impress me with his vegan custard-making skills once, but I’ve never tried myself. I love how light-feeling of a dessert custard is, yet you still get your sweet fix. 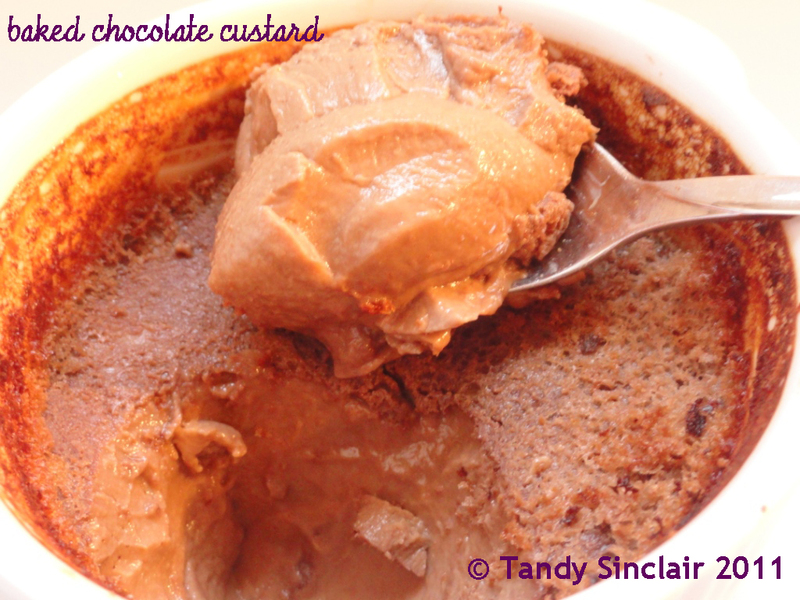 Oh what a fabulous baked custard recipe Tandy – another one for the top of the “must try” pile. A little bit of sin each night is a good thing! Gorgeous – I love custard too and they like it in Spain…natillas which is cold set custard with a biscuit on top (a little strange, I know) and powdered cinnamon. I think this would be a big hit here!